After a wet but fun day in Inistoige, our next event is our marathon in Kinnity on the 28th of April. We will have both a 1/2 marathon and a full marathon on offer, for more details check out the calendar. All those who complete will receive a medal. The event is open to both members and non members so don’t waste this opportunity and book in quickly!! 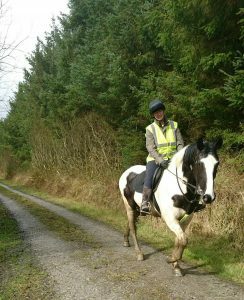 If you want to come along and do a shorter distance, we will also be offering trail rides on the day. You must book in by Sunday the 21st of April if you want to take part in the marathon, details on the calendar or pm us on facebook at Endurance Ireland. Endurance Ireland is also thrilled to share our fantastic news, we were one of the finalists in the Irish Sport Horse Industry Awards 2019 Top Organisation Category, it is a great achievement for our club and to see the presentation, check out the video below. Unfortunately we didn’t win (this year!!) but we are delighted to have all of our hard work promoting the sport of Endurance and our innovative initiatives recognised. We would like to extend our thanks to Liam and Deirdre Geddes for their support.